Today's daily dose of inspiration (also known as ‘homify 360°’) comes from Johor Bahru, the capital of Johor. 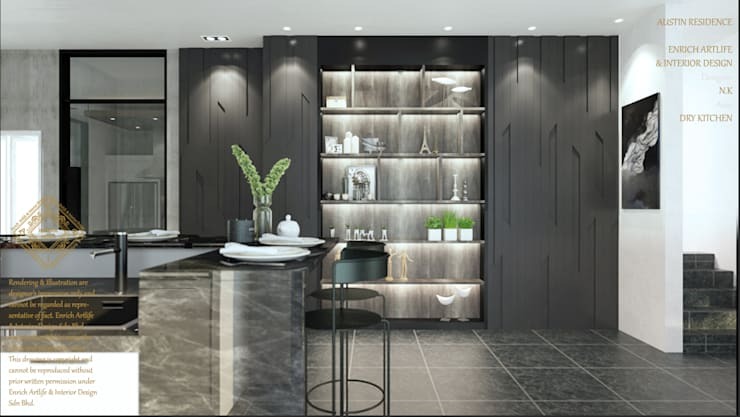 Here is where Enrich Design (EAID) are showing us what brilliance they possess when it comes to styling up a semi-detached house. 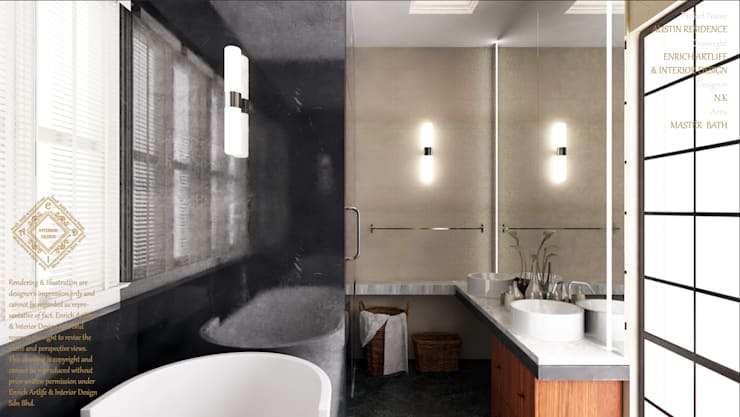 With dream homes as the main focus, EAID pride themselves on taking their clients’ needs and wants into consideration. 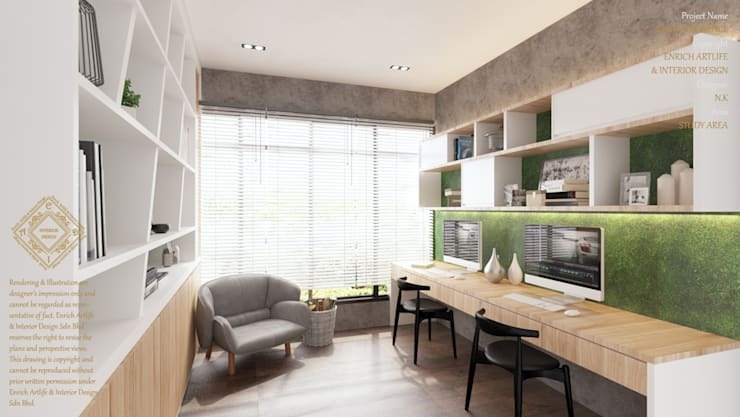 High-end residential designs are these professionals’ speciality, including cluster houses, detached homes, bungalows and, as we are about to discover, semi-detached homes. Project costs are generally in the range between RM400K to RM 1 million. In order for clients to get their money’s worth, these custom-made designs are combined with strict quality controls to ensure both safe and super stylish structures. Let’s see what interior excellence these professional interior designers/decorators are capable of. 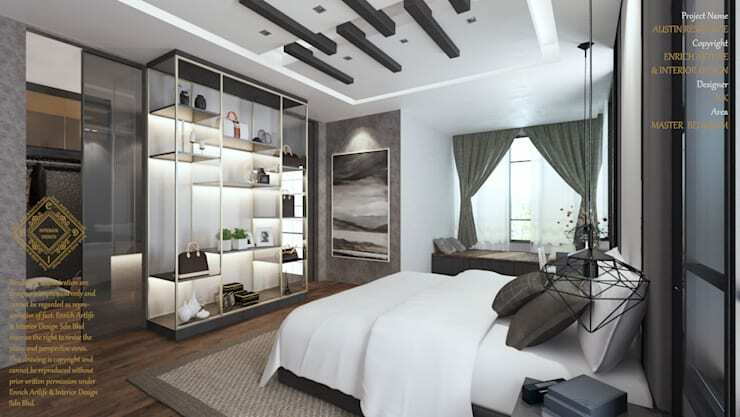 With the general Malaysian leaning towards a modern and simplistic design, EAID have completed numerous projects which touch upon Chinese, European and even Japanese postmodern design. 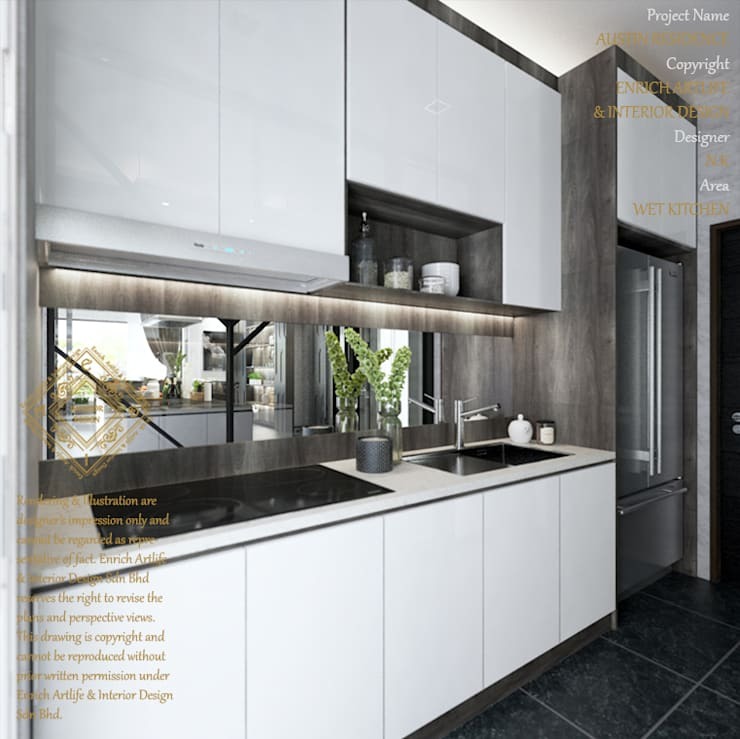 And as these professionals are known for tailor-made designs that blend artistic impressions with individual architectural atmospheres to create unique spaces, it should come as no surprise that this kitchen (the heart of any home) is exceptional in terms of design, style and a unique ambience. 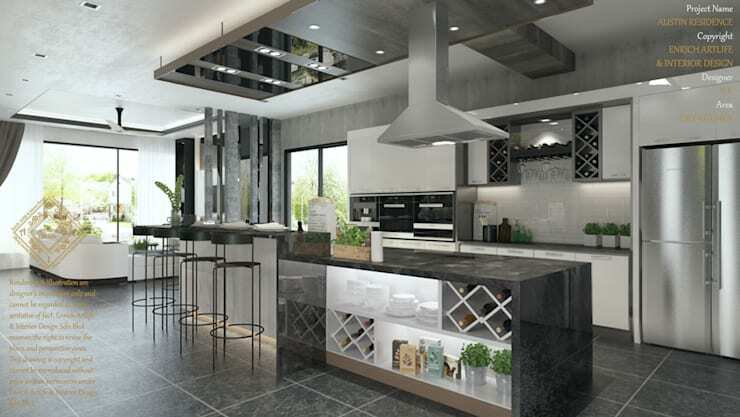 Of course a pretty cooking space will only get one so far, for any kitchen also needs to be functional and practical. But even here EAID ensure superiority with their designs. 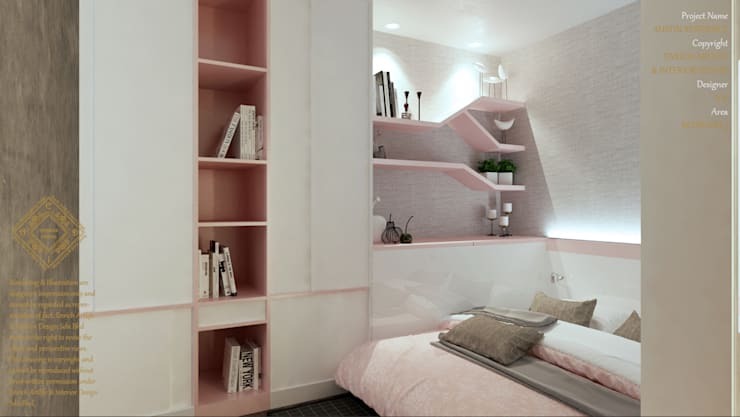 This is evidenced by that open-shelf design with exquisitely placed lighting, highlighting various décor elements that add to this space’s visual quality. Even though EAID’s main focus is to take on projects in and surrounding Johor Bahru, clients are welcome to request additional locations for designs. Adding to their reputation of supreme professionalism, EAID implement strict controls in monitoring all building / construction progresses. Timely meeting with all the parties are essential to keep everyone on the same page and immediate rectification could be complete so to reduce the chances of un-expected events. The same high-end finishes of the open-plan kitchen-and-dining-area translate perfectly into the adjoining living area. 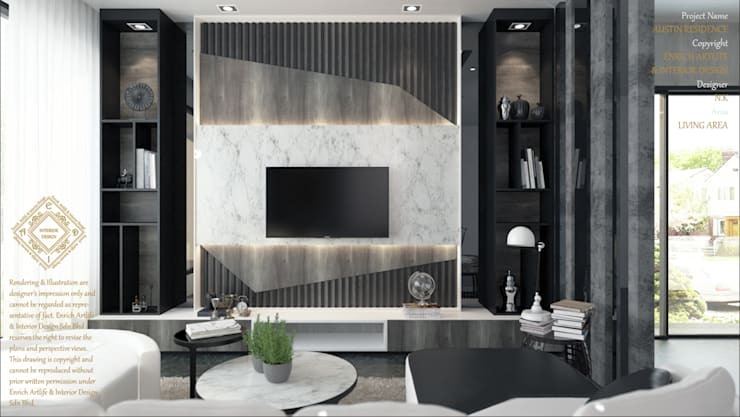 With a similar neutral colour palette (where off-whites and daring greys beautifully create monochrome magnificence), this living room becomes so much more than a mere space for watching television. 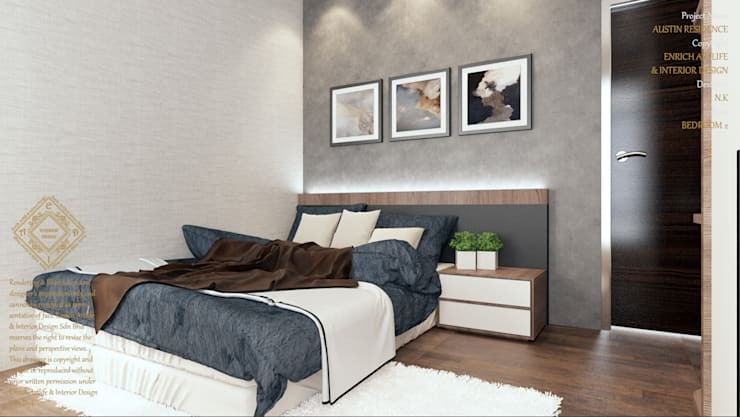 For the master bedroom, the colour palette takes a softer approach by welcoming in more whites and brown earthy hues, ensuring an ambience of warmth and relaxation. To keep the interior style top-notch, an abundance of natural light is welcomed in via generous windows, not to mention the fact that aforementioned light is scattered around with the help of mirrors and other reflecting surfaces. To continue being inspired by this project of EAID, have a look at the rest of these sublime interiors. Like what you see? Contact Enrich Artlife & Interior Design to get started on your own project or see more of their work here. We find this design exquisite, but would much rather hear what you think of it.